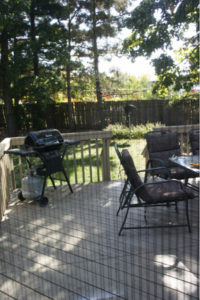 In case you missed the review of our Plisse retractable screen over on A Magical Mess, we’re revisiting it today for ya. Back in the fall of 2012 the blogger Naomi, of SweepTight.com at the time, had just bought her first home and wanted to try out our Plisse retractable door screen. Visit the blog to read her retractable screen review addressing measuring, installation and the end result. We helped her along, as we are more than happy to do with any of our customers, by looking at some pictures of her doorway and directing her on the best measuring locations. She received her new Plisse invisible screen last week and went right to work installing it – reportedly doing so in less than hour with no trouble at all. Take a second to pop over to her review on the SweepTight.com website and see for yourself what an objective user thought of her experience with me, Doug, the Screen Guy, my company, Screen Solutions, and our product – the patent-pending Plisse retractable door screen.